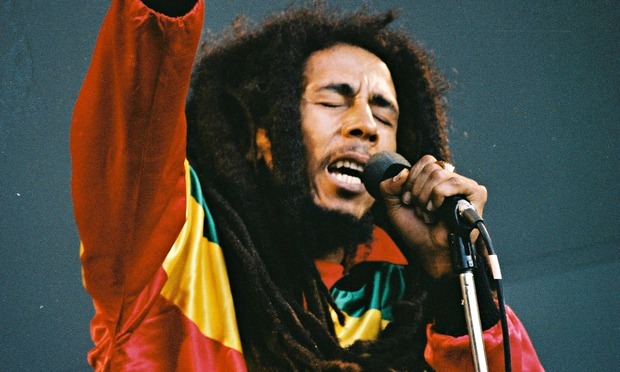 Bob Marley was born on Feb 6th, 1945, in St. Ann. His mom at the time was an 18 year old Jamaican native, and his dad was a 50 year old white navel captain. The couple got married in 1944 a year before Bob was born. In 1950 Marley moved to Trench Town - Kingston. After Marley dropped out of school he became interested in music. In early 1962 Bob Marley, Bunny Livingston, Peter McIntosh, Junior Braithwaite, Beverley Kelso and Cherry Smith formed a ska & rocksteady group called "The Teenager" which later became The Wailing Rudeboys it was changed again to The Wailing Wailers and eventually became The Wailers . Bob Marley has been a great influence in the lives of many present day musical artists and other performers. He grew up listening to the legendary Fats Domino, Ray Charles, Curtis Mayfield, the Drifters and Louis Jordan. Bob Marley would put his first record out on wax in February of 1962, the song was called "Judge not." When it came out it was an instant hit locally, but his international fame would not spread for a couple of years. In 1976 'Rastaman Vibrations' was released and the album made its way on to the American charts. In December of 1976, an Assassination attempt took place at his house and Marley was shot. Another album was released and stayed on the European charts for 56 weeks. In May of 1977 during the Exodus tour he was playing football and injured his toe. The injury never healed, and he never got it treated and continued on his tour. Marley's last concert would be in Pittsburgh on Sept. 23, 1980 at the Stanley Theater. He would undergo many different treatments to keep him alive longer, but on May 11th, 1981, Bob Marley died at the age of 36 from cancer. Although Bob has been dead for years, his music lives on through his sons: Stephen, Ziggy, Julian and Kymani. Bob Marley not only was one of the greatest musicians in the history of music, he is also one of the greatest men in the history of the world, through his music he not only touched the lives of his fellow countrymen and he has influenced the lifestyles, attitudes and feelings of people all over the world. Mission accomplished! Thanks to ATL motors Bob Marley‘s old Land Rover has been restored just in time for his recently 70th birthday celebration. Bob’s matte-blue 1977 Series III Land Rover, which was left sitting to rust following the singer’s death over 30 years ago, has been completely restored thanks to the Caribbean’s number one resort company Sandals Resorts International, ATL Automotive, ITC — the regional distributors for Land Rover as well as the Marley Family. Chief Executive Officer for Sandals Resorts International, Adam Stewart, said that he was extremely honored and proud that he and his team could give something back to a man who had given so much, not just to theJamaica, but the world.